This article was written By Adam Douglas on 17 Mar 2012, and is filed under Uncategorized. Sanshiro Sugata is an interesting film for a number of reasons. One, it’s Akira Kurosawa’s debut film; two, it’s a genre picture, something Kurosawa didn’t tackle often; and three, it was made and released in 1943 while Japan was embroiled in war in the Pacific, and thus subject to wartime censors. Donald Richie, in his book A Hundred Years of Japanese Film, reports that a love scene was cut from Sanshiro Sugata. That the film was released at all is surprising given its decidedly Western approach to character. The titular lead, a ruffian rickshaw driver played by Susumu Fujita, begins the film as a wild youth and ends with humility, discipline, and control. This is not achieved, however, through the acceptable methods of group participation and sacrifice, but through a Western-style discovery of self. It’s the Meiji era (1868-1912), a time of great change in Japan, and wild man Sugata wants to learn judo, one of the new forms of martial arts being developed in the country (karate, another new style, will feature prominently in the sequel). He joins a dojo and learns what it means to be disciplined, abandoning his drunken, street-fighting ways as he comes into himself. Fujita is more believable as the transformed Sugata—his friendly face is better suited to inner tranquility than to a young man’s rage, but he is nevertheless consistently good throughout. As Sanshiro Sugata is a genre picture, it is beholden to the usual genre picture trappings. Being a martial arts picture, it must have the requisite fight sequences, and they arrive like clockwork: the initial fight, in which the dojo master handily dispatches a group of rival-school toughs; the mid-film fight, in which Sugata reluctantly takes on the aging Hansuke Murai (Kurosawa regular and Toho player Takashi Shimizu); and the climactic sequence, staged on a hilltop field. 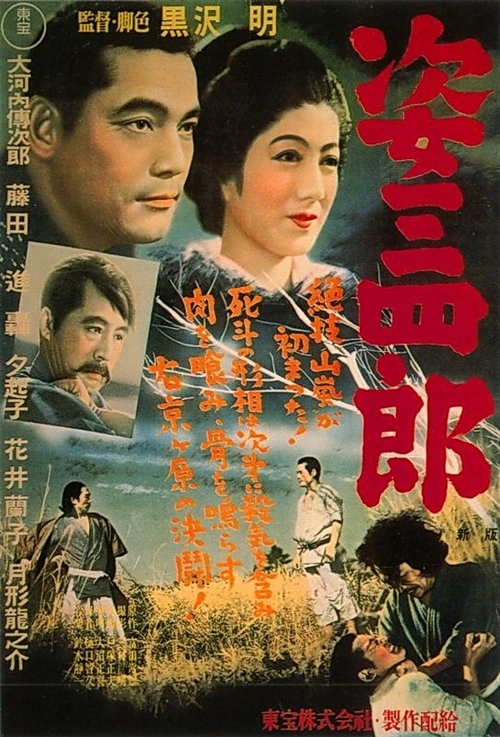 That Kurosawa has chosen to set the final fight in a field of deep grass, thus obscuring the action—judo is fought low to the ground—reveals his ambition. Kurosawa, right from the outset it seemed, wanted to make art, not just films, and by down-playing the whole reason for coming to a picture like this—namely, the fighting—he makes a point about violence and the ultimate pointlessness of it. That Kurosawa is making these kinds of statements right out of the gate—in a wartime martial arts picture no less—reveals the kind of filmmaker he already knew himself to be. Repeatedly throughout the film, Kurosawa adds these kinds of little touches to enrich the story. When a challenger is thrown by Sugata against the wall, a broken piece of screen falls in slow motion, a surprising and stylistic coda to the action, and one that Kurosawa would re-use in Seven Samurai (1954). Even something as commonplace in a martial arts film as the spiritual awakening of the young tough is enhanced by artistic lighting: a lotus blossom bathed in floodlights amidst a night-black pond. 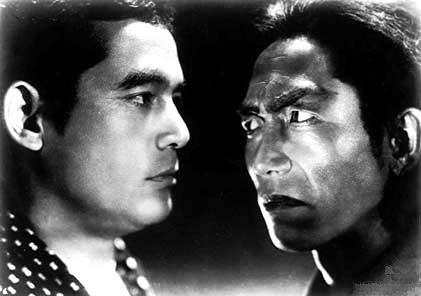 In 1945, Kurosawa made Sanshiro Sugata 2 at the request of the studio and, it would seem, the government, creating a moderately entertaining if flat piece of propaganda. Sugata fights an American boxer and gets a lecture from his sensei on the importance of fighting, an odd message considering the previous film. But Kurosawa still reveals his artistic side: one of the antagonists, the mad younger brother of the man defeated in the previous film’s climactic sequence, is outfitted in makeup and a noh wig, a bit from classical Japanese theater, a well which Kurosawa would return to often in his film career. Five years later, Kurosawa would release Rashomon and everything would change. But here, in the midst of a war, we can see the artist on his way up, testing and experimenting, yet fully confident in his abilities.